Flaky and moist salmon is the star of this dish. The salmon is roasted with olive oil, lemon, and garlic. 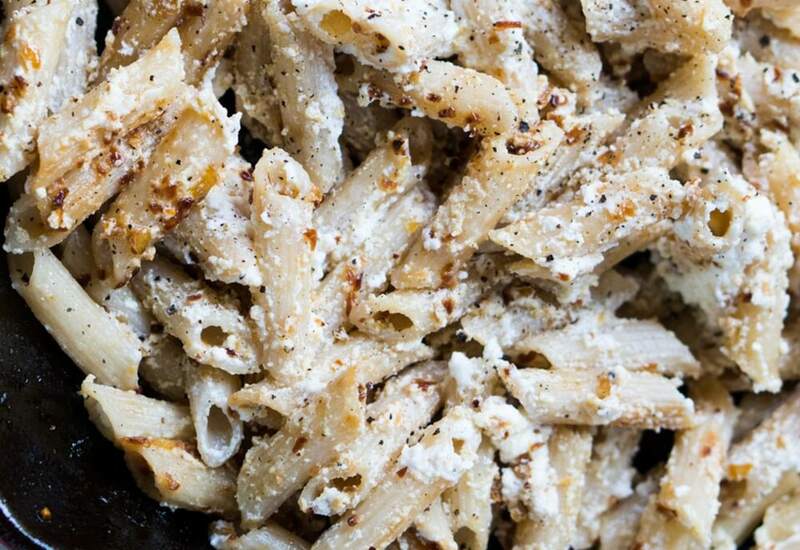 It is then tossed with cooked pasta and ricotta cheese. It is an outstanding quick and healthy meal that is full of flavor. In about 30 minutes, dinner is served! Just before sitting down to that first bite, be sure to finish it off with a squeeze of fresh lemon. You won't regret it! For an even quicker take on this dish, you can cook the salmon in a skillet. You will save about 10 or 15 minutes. Or if you are really short on time, you can used canned salmon; just sauté in a skillet with lemon zest and garlic until warmed and fragrant, about 2 minutes. Goat cheese would make a nice creamy substitute for the ricotta cheese. Any variety of pasta will work with this recipe; try rigatoni or spaghetti! Per Serving: 800 calories; 50g fat; 53.0g carbohydrates; 38g protein; 112mg cholesterol; 346mg sodium. I too would skip the salmon and ricotta mixture here. I used chicken and really liked this, but I don't like fish and dairy together. Used some of our leftover penne to make this pasta dish. This one was alright. Not my favorite dish I have made, but so-so. The pasta portion of it was good. I would probably skip the salmon next time and just opt for chicken or fresh peas in this one. I liked the salmon with the ricotta sauce. I cooked the salmon in my cast iron skillet and it turned out great. I used orecchiette pasta instead of penne also. Took out the salmon and made this vegetarian by adding broccoli and carrots. It's one of my favorite pastas, especially the ricotta sauce. So rich and decadent. Made this with canned tuna. I thought it came together nicely. Used spaghetti noodles instead of penne also. Great with the sauce. Not something I would eat regularly because of the carbs. Maybe next time I will try with zoodles.